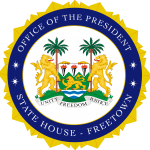 State House, Freetown, Wednesday 2 August 2018 – Outgoing Guinean Ambassador to Sierra Leone, His Excellency Fode Camara, has called at State House to bid farewell to President Julius Maada Bio, marking the end of his four years’ diplomatic representation to the country. He said after everything he had done in the country he was pleased that the presidents of the two countries enjoyed a very strong relationship, adding that as diplomats it was their responsibility to strengthen the relationship between countries. “I am happy that the relationship between the two countries has grown considerably during my tenure here and I wish it continues to grow with my successor. The New Direction is very encouraging so far, especially on its educational policies as well as the efforts in increasing the flow of electricity in the country within the shortest timeframe. This is very encouraging, and this will challenge other African countries. With your determination and patriotism, I am sure you will conquer the obstacles,” he said. On his part, President Bio thanked the outgoing ambassador for his service to his country and Sierra Leone and expressed appreciation for his efforts at developing the relationship between the two countries. He wished him all the best in his new endeavours.